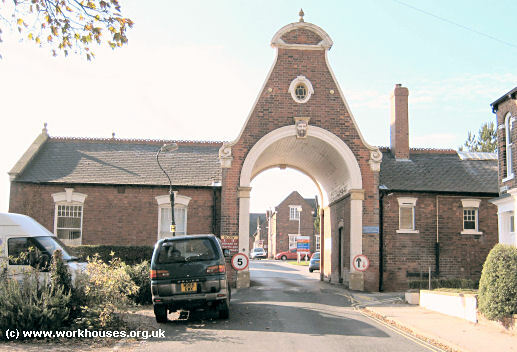 A workhouse was set up in Beverley in 1727 following Knatchbull's Act of 1723, which allowed parishes to combine for this purpose. The joint parish of St Mary and St Nicholas together with St Martin operated a combined workhouse until 1795 when the premises were divided in two. The opening of Beverley's workhouse was the subject of a report in the second edition (1732) of An Account of Several Workhouses... dated March 25, 1728. The workhouse appears to have been highly effective in reducing the number of claimants on the poor rate. We were enabled to build a Workhouse, capable of containing about 100 People, which we proposed not to open until Midsummer 1727, that we might not hazard the Health of the Poor, by placing them in a damp House. The Overseers, at their request, gave Notice to all the Poor that the Weekly Allowance were to cease at Midsummer; that such as were not able to maintain themselves and Families, must apply to the Governors of the Workhouse, to be by them provided for. And tho' before the opening of the House, 116 received the Parish Allowance, not above 8 came in at first, and we have never exceeded 26 in the House all this Winter, tho' all kind of Provisions have been excessively dear, and the Season very sickly. The most of the Poor who have come into the Workhouse, being either very old, or Children, we have not much benefit from their Labour; such as have been accustomed to spin, knit, sew, or work Lace, we employ in what they have been used to, the rest in picking Ockam, in the Business of the House or Garden, or let out for Hire as Labourers, or to work at their respective Trades for such Wages as we can get, and for which they were too proud, or too lazy to work, before they were under our Management; and for that Reason, either starved, or were thrown upon the Parish. As to their Diet, we allow Flesh Meat twice a Week, on other Days, Rice-Milk, Hasty-Puddings, Pease-Porridge, Baked Cakes, Puddings or Dumplins; for Breakfast and Supper, Bread and Milk in Summer, Milk-Porridge in Winter, and sometimes Bread and Cheese. To encourage the Poor People to work, we allow them two Pence out of every Shilling they earn. We oblige the poor that come into the Workhouse to wear Badges on their Sleeves, pursuant to the Statute: This we found our selves obliged to do, to prevent some People coming into the House, who might not be necessitated to do, or might have some Relations able to relieve them, and who would, or did so, rather than suffer the Badge to be worn. 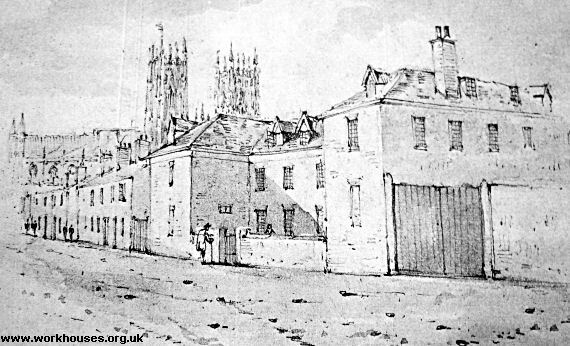 A 19th century illustration of the Minster Moor Gate workhouse. A parliamentary report of 1777 recorded local workhouses in operation at Beverley (for up to 100 inmates), Kilnwick (4),Lund (4), North Newbald (4), and South Newbald (6). South Cave had a workhouse from 1786 at West End. The establishment was also used by the parish of Broomfleet in aroun 1812-15. East Riding: Aike, Beswick, Beverley St Mary (2), Beverley St Martin (2), Beverley St Nicholas, Bishop Burton, Brantingham, Cherry Burton, Ellerker, Elloughton with Brough, Elton, Eske, Holme-on-the-Wolds, Kilnwick, Leckonfield, Leven, Lockington (part of), Lockington (part of), Lund, Meaux, Molescroft, North Newbald, South Newbald, Routh, Rowley, Scorborough, Skidby, South Cave, South Dalton, Stockhill, Thearn, Tickton, Walkington, Wawn or Waghan, Weel, Woodmancy & Beverley Park. The population falling within the Union at the 1831 census had been 15,868 with parishes ranging in size from Stockhill (population 34) to Beverley St Mary (3,359). The average annual poor-rate expenditure for the period 1834-6 had been £7,069. 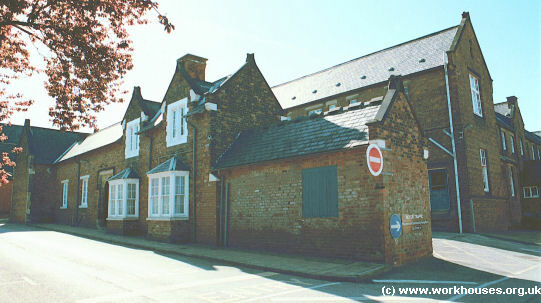 Initially, the Beverley Guardians declined to build a new workhouse but made use of an existing building on the south side of Minster Moor Gate, Beverley. Its location and layout are shown on the 1853 map below. Beverley Minster Moor Gate workhouse site, 1853. Males were accommodated at the west of the building and females at the east, with the Master's quarters at the centre. Narrow yards for each class of inmate lay at the rear of the premises, with a utility block at the southern end containing bath-house, bakehouse, and sheds. The men's yard had a dividing partition half way down, presumably to confine the men to the northern end while other classes accessed the bath-house via connecting gates at the southern ends of their yards. The building was sold in 1864 after the opening of a new workhouse at Westwood and then demolished. In 1860-61, after the Beverley Guardians had finally agreed to the erection of a new building, a workhouse for 189 inmates was erected at Westwood, at the south-west of Beverley. Its location and layout are shown on the 1926 map below. Beverley Westwood workhouse site, 1926. An early view of the Westwood workhouse from the south-west. The red brick Tudor-style building cost £5,500 and was designed was by John and William Atkinson of York. The Atkinsons were responsible for a number of other Yorkshire workhouses including Bedale, Easingwold, Guisborough, Goole, Howden, Pocklington, Skirlaugh and York. 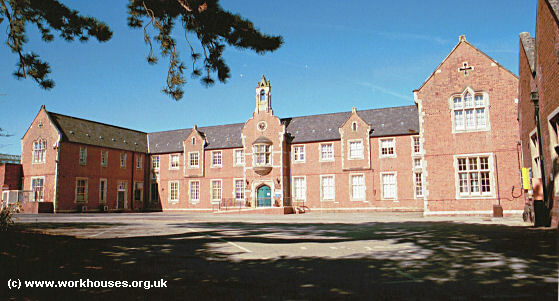 Beverley main building from the west, 2001. Beverley from the south-east, 2001. In 1892-4, a 60-bed infirmary was added, together with casual wards for 41 vagrants (29 male and 12 female) and 6 stone-breaking cells. The infirmary consisted of a central administrative block and two pavilions, one for men and one for women. 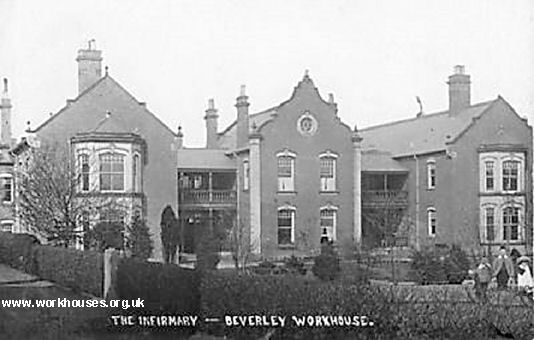 Beverley workhouse infirmary from the east, c.1910. Beverley western infirmary wing from the north-west, 2001. A new entrance lodge and casual wards were added in 1895. 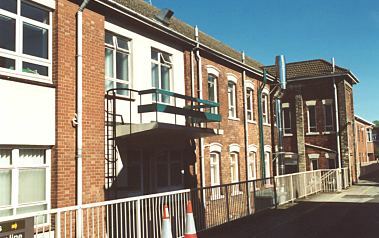 Beverley entrance block from the south-west, 2001. 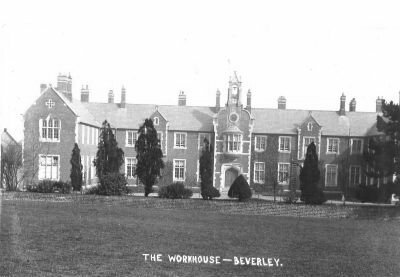 The workhouse later became Beverley Public Assistance Institution, but was taken over as a hospital in 1939. During the Second World War, the site was a base hospital of the Emergency Medical Scheme and in 1940 eight timber-built ward blocks were erected at the north of the site. After 1948, the site became known as Westwood Hospital. By the early 1920s, the Beverley Union was operating a children's Receiving Home on Norwood, for children coming into the union's care. In 1924, it could house up to 18 children, with Miss A. Ward as Superintendent. East Riding of Yorkshire Archives and Local Studies, The Treasure House, Champney Road, Beverley HU17 9BA . Holdings include: Guardians' minute books (1836-1930 with large gaps); etc.